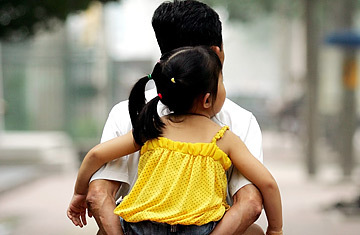 A father carries his daughter in Beijing, China. Harrowing details have emerged in recent news reports of alleged forced abortions in China's impoverished Guangxi province. Earlier this month as many as 61 pregnant women were injected with an abortive drug after being dragged to local hospitals, according to media accounts. Human rights activists say actions allegedly carried out by family planning officials there are unlikely to be isolated. Along with forced sterilization and other coercive methods of birth control, forced abortion continues to be practiced occasionally by officials in remote parts of China despite its having been banned by the central government in Beijing. In urban areas, the central government recently relaxed its strict laws mandating birth control in order to restrict families to one child. The government also insists that it has banned coercive birth-control practices in the countryside commonly employed by bureaucrats eager to comply with Beijing's population-control goals  and those practices have declined dramatically since the 1980s. The central government recognizes that coercive birth control is deeply unpopular and liable to cause the sort of demonstrations and other forms of protest that Beijing abhors as a threat to its authority. Still, the fact these cases continue to surface is a troubling reminder of what activists say is the schizophrenic approach of the central government towards its own one-child policy: On the one hand, the authorities are loosening up, well aware that the scheme, which restricts couples to one child and imposes fines and other sanctions on violators, has largely outlived its usefulness. First implemented in 1978, the one-child policy has been so successful in checking China's population growth that the country now confronts the prospect of the rapid aging of its total population in the next two decades. The reaction of many Chinese demographers, not surprisingly, has been to call for the abolition of the one-child policy, which they say has served its purpose. Other critics point out that India has achieved broadly similar declines in fertility without state coercion or occasional brutality. Despite the growing consensus calling for change, however, Beijing continues to make enforcement of the policy one of the two main yardsticks by which the performance of local bureaucrats  and hence their prospects for advancement  are judged. (The other is tax collection.) It is this pressure from above to comply with population quotas that prompts local officials to adopt measures such as forced abortion (sometimes heart-rendingly late in term), forced sterilization and the like, says Nicolas Becquelin of New York-based Human Rights in China. "The occurrence of these cases is largely confined to poor or ethnic areas of China" says Becquelin, noting that in such areas the central government often seems to fear that if restrictions on population growth are lifted there will be an immediate population explosion. That would be highly unwelcome economically  with [Communist Party] cadres fearing that the new mouths would either be trapped in poverty at home or join the flood tide of rural migrants swamping the cities. More broadly, the ruling Communist Party is having a difficult time coming to terms publicly with the idea that the one-child policy has been a failure and should be scrapped. Precisely because this is one of the Communist Party's most unpopular policies, "it would be very damaging to the Party to have to admit publicly that it was neither a particularly good idea, or even necessary," says Becquelin. Given that background, he concludes, it seems as though incidents of this kind will continue to occur for some time to come.